Putting a price tag on certain people is certainly not something we teach our children, yet some politicians expect us to think in those terms... Examining what it means to be a “net contributor”. Like many EU citizens living and working here, I am apparently a net contributor. That means I pay more into the system than I take out, e.g., in public services or school places for my children. Net contributor. Sounds nice and industrious, doesn’t it? People don’t usually think of themselves as net contributors. I wouldn’t have thought about myself in those terms prior to June 2016. I didn’t even think my presence in this country needed justification, as I was using my treaty rights as an EU citizen to live and work in the UK. If I had thought about the question at all, I would have thought I was here among friends, colleagues, family, a teacher to my mostly British students, etc. Those are human relationships that ultimately still matter more than economic worth. 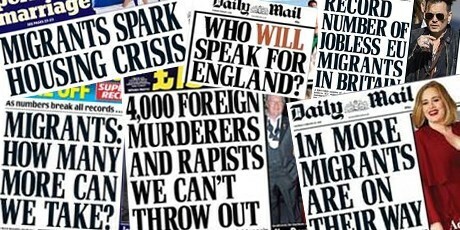 But already during the Referendum campaign it was clear that portions of the UK media, and UK politicians, didn’t think of people like me in human terms. And post Referendum, it’s not much better. Our prime minister called us queue jumpers and then didn’t really apologise for it. Worse, our right to remain here will be subject to a criminality check (in the settled status application). Linking our very presence in this country to crime, a move borrowed from the tabloid press playbook. I’ve helped co-edit a book of testimonies from British in Europe “In Limbo Too”, who now see their rights reduced as well, and have contributed to “In Limbo”, a book of testimonies of EU-27 citizens living in the UK. Through these testimonies, we hope to show the human face of immigration, away from thinking about us in purely economic terms. This is a difficult task, as politicians left and right talk about us in liquid metaphors, as some stream of water you can turn on and off at will. And they, including David Cameron, kept on repeating the tired old refrain that we were weighing on public services, that the UK can’t take more of us, etc. No wonder that the EU Referendum squarely focused on immigration (look at the word cloud of reasons of those intending to vote Leave prior to the Referendum). Now a government-commissioned report has finally put those lies to rest: we’re net contributors. We don’t weigh on public services. We even hardly make a difference in the house prices. Net contributors means that we not only contribute skills, productivity, but also on average net pay in taxes to the tune of £78,000 over our lifetime. Compare: the average British citizens’ net contribution is zero. Note that while politicians were eager to jump on the economic bandwagon, they haven’t changed their tune in the light of these facts. Their arguments about immigrants are only economic when they can twist the facts to fit their narrative. When the facts are not what they thought, and it turns out we’re good for the economy, then suddenly immigration becomes a matter of culture, and about concerns of the left-behind white British voters. The common argument for why we should still be blamed for the ills of the UK is precisely those left-behind. We’re somehow to blame for the predicament of people living in Leave-voting areas such as Stoke-on-Trent (not a net contributor to the British economy, mind! ), who did not profit from immigration. Or, at the very least, so the argument goes, their predicament makes their xenophobia understandable and makes it important that their xenophobia is translated into governmental policy. We should listen to people’s concerns on immigration! This is a common refrain: people want better public services, sorry, there’s no money. People want fewer immigrants: your wish is our command (even if doing so will harm the economy and will take away rights from British citizens and EU citizens). It’s almost like a political class is using the “genuine concerns” of a left-behind electorate as an easy excuse to enable them to pursue their own ethnic cleansing policies. In response to this worry about the left-behind, let me point out that EU citizens who come to live and work in the UK, with the exception of the Irish or people who have jumped through the hoops of obtaining British citizenship (with a price tag of over £1,300 at the very least), have no say in how their taxes are being used. They have no vote in parliamentary elections. If I had a say into how my tax returns are spent, I’d love to see them spent on the NHS, schools, benefits for the poor, programmes to reduce social inequality. This is the problem with taxation without representation. As an enfranchised taxpayer, you can shape votes. As a disenfranchised taxpayer, you can easily become the topic of a vote, without having a say in it. The UK is not averse to thinking of net contributors, of course. Margaret Thatcher started calculating who “net contributes” to the EU, and found unsurprisingly the UK was net paying in. This way of calculating is not in line with the spirit of the EU project which was to increase political as well as economic integration, by lessening the economic differences between regions, hence the EU subsidies to Wales and Cornwall. The UK ended up getting a rebate on their contributions. Maybe, as an immigrant net contributor I should get a rebate on my taxes too? Does this strike you as surreal, that immigrants should get a rebate on their taxes? Well, that’s exactly what The Netherlands does! For people who come for skilled jobs where workers are in high demand there is a reduction on taxes. This is done through the 30% rule, where your employer can pay up to 30% of your salary tax-free. The Netherlands values its foreign workers, and does this not out of altruistic kindness, but in order to retain them. Due to a variety of factors, including the ease of language (English is dominant and many people speak it as a second language), openness of the labour market, and the decision of Labour governments to not impose restrictions to EU immigration, and successive governments not to use the free movement directives, the UK has had a lot of benefit from EU citizens coming here and net contributing. And that has made it easy for them to now use immigration for political gain. Soon the chickens are coming home to roost. Net non-EU migration is already up, to replace the EU citizens who are (understandably) a bit hesitant to take up positions here. A recruitment crisis looms in the health sector, with doctors and nurses leaving in droves. The grown-up debate on immigration the UK will then, better late than never, have will have to consider: in how far do we still want those pesky foreigners’ net contributions? In how far do we want a more ethnically homogeneous UK? Those questions were already asked in the Tory-LibDem coalition years (see e.g., here) but the UK decided even then that it was better to have austerity for 50 years, as they put it: austerity should be a permanent “way of life”, rather than having a more welcoming immigration regime. It’s one thing to be reduced to one’s net economic contributions. It’s quite another thing to find out that even that is not good enough, and that the UK would rather see economic harm and permanent austerity than welcome more workers from abroad. What a ‘No Deal’ would mean for 5 million citizens in Europe.